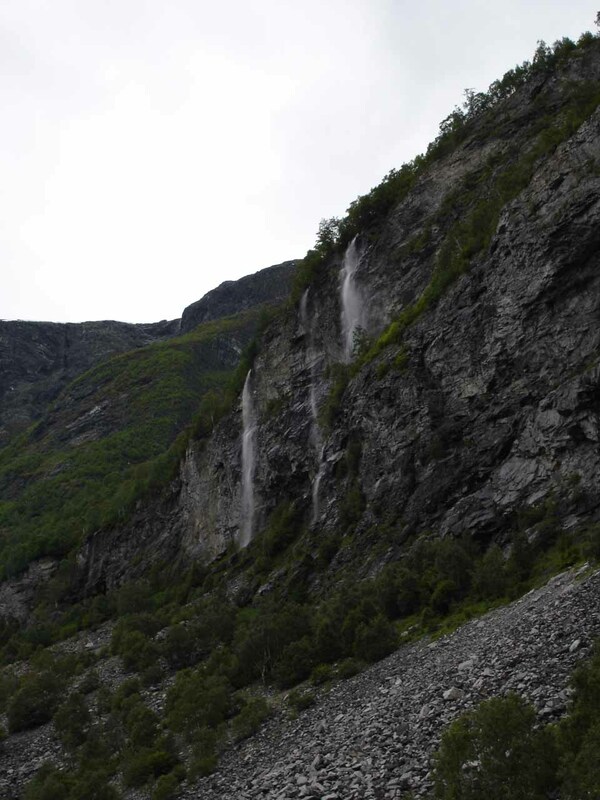 Hjellefossen (I think is pronounced “YELL-eh-foss-un”) was the first of the major unregulated waterfalls we saw in Utladalen Valley. 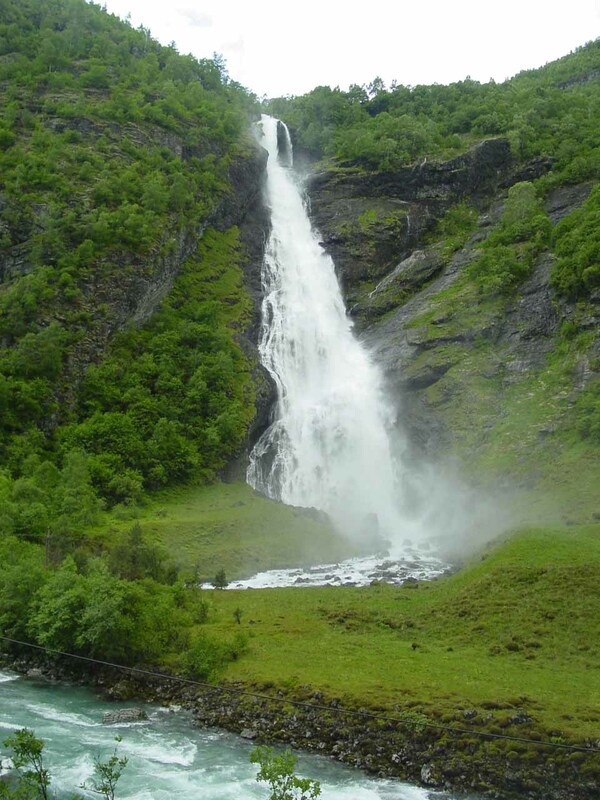 However, with this waterfall, we didn’t have to do any hiking to see it. 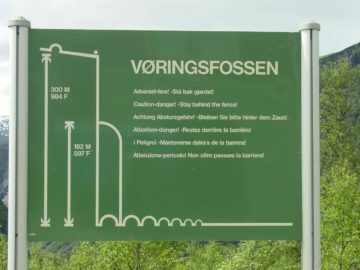 It had a conspicuously forceful flow as the Hjelledøla made its 120m drop (though I’ve seen it reported to be 240m, which I thought was rather generous) into the Utladal Valley as it fed the River Utla right before a turf-roofed building besides the nearest car park (see directions below. 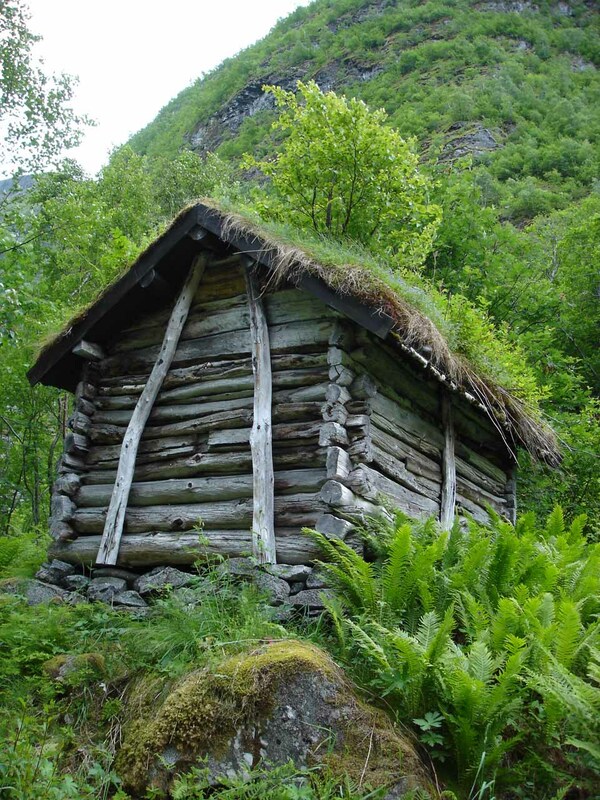 It turned out that this turf-roofed building was a very clean restroom (one of the cleanest we had ever seen especially considering that most restrooms in Nature tended to be dingy and grungy). 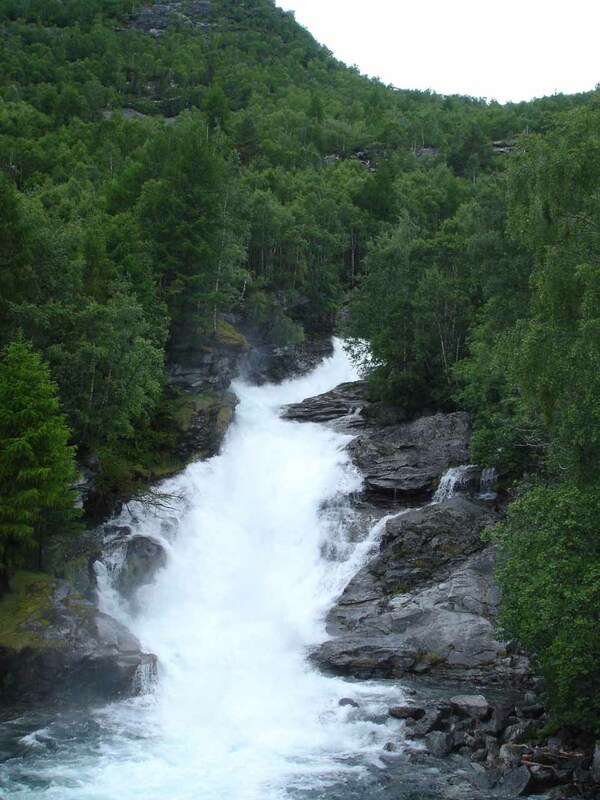 Julie and I managed to get a few views of the falls both from the restroom area as well as from a misty bridge over the Hjelledøla Stream. There were power lines running alongside the road which kind of took away from the viewing experience. That said, we felt the best views were probably from further away (say the restroom and car park area), which provided us with the waterfall’s context. 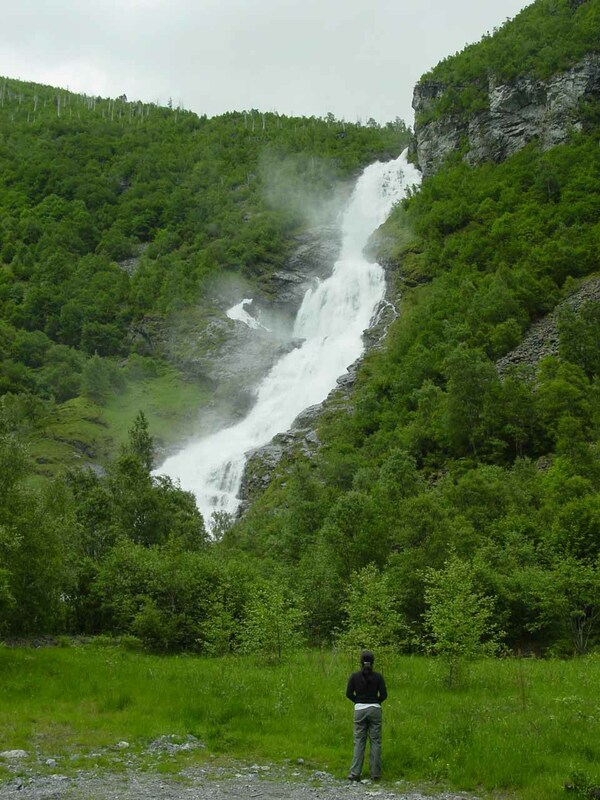 It proved to us that sometimes the closest view of the falls wasn’t necessarily the best. 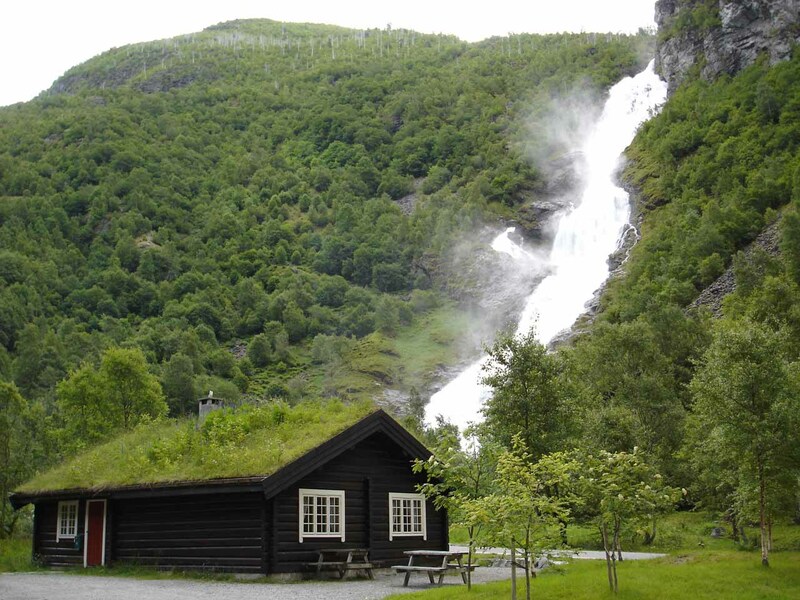 By the way, the turf-roofed building that we saw at Hjellefossen was the first time that Julie and I had ever seen such a building in person. 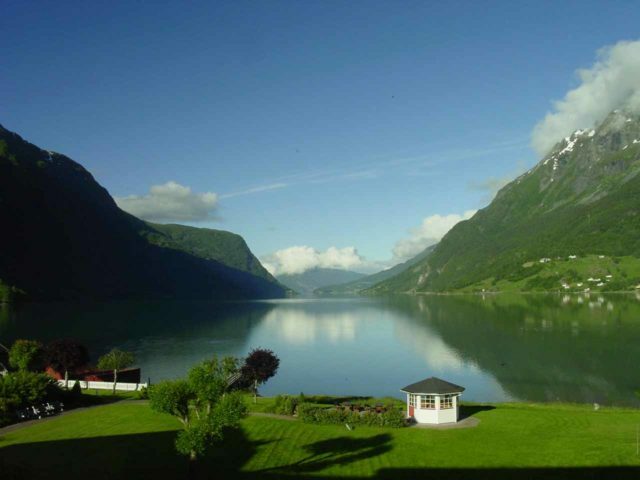 Later on in this trip and through the years, we’d come to learn that they were actually quite common throughout Scandinavia though we witnessed them personally in both Norway and Iceland. Apparently, it was a practice that went on for centuries in Scandinavia. Sometimes I wonder how these buildings would rate in a LEED certification considering it made use of local resources and seemed to blend in well with the landscape. 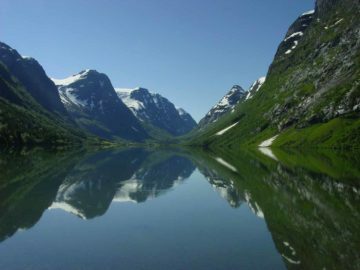 was our introduction into Jotunheimen National Park (even though it was technically not in the main highlands that the park was most known for). 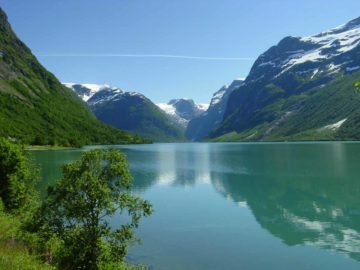 Jotunheimen (pronounced “YOOT-un-hai-mun”) I believe translated as the “Home of the Giants,” which was probably in reference to the tall mountains in the park. 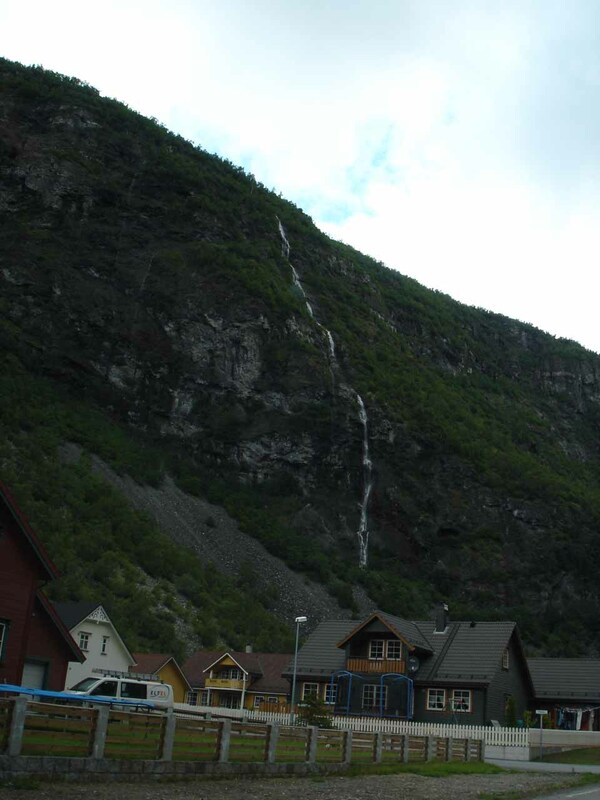 But as you can see from this waterfall, the mountains weren’t the only things that were tall! 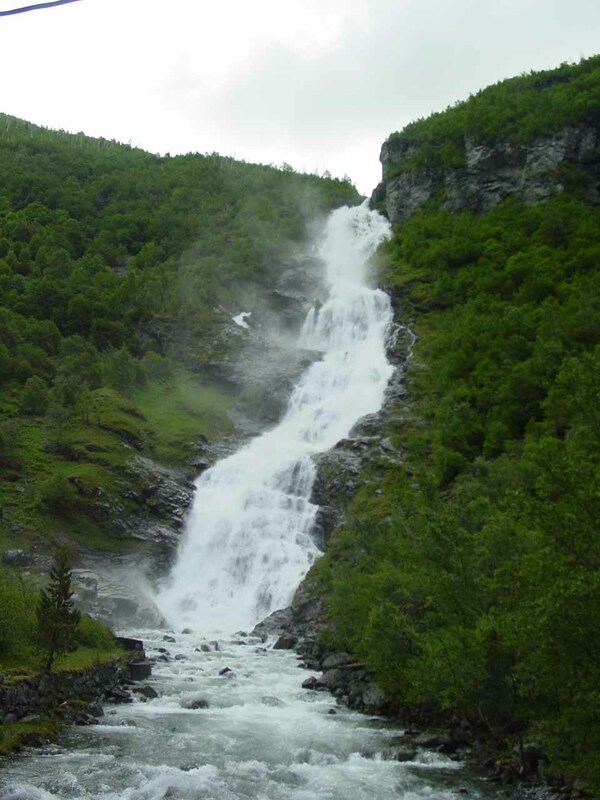 Another thing about Utladalen was that it apparently was said to have the highest concentration of unregulated (and protected) waterfalls in Norway. 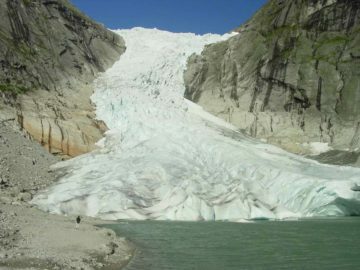 This was something we came to appreciate later during our visit as we went deeper into the Utladal Valley. 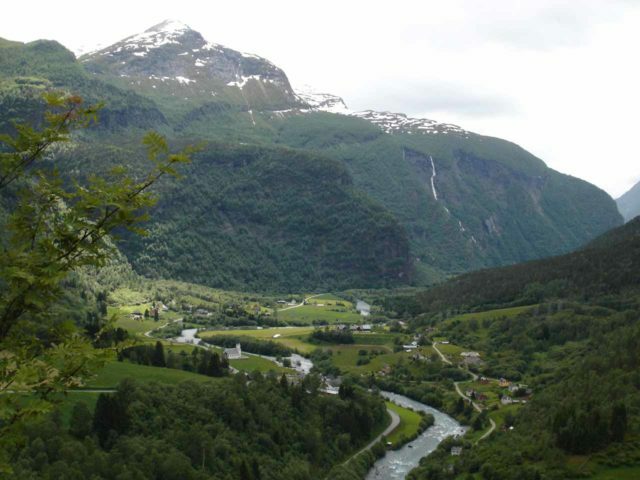 Hjellefossen resides in the Ardal Municipality. 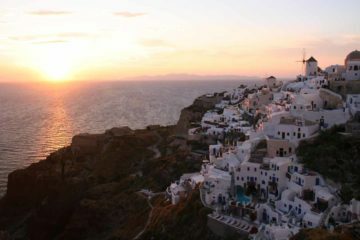 For information or inquiries about the area as well as current conditions, visit their website. 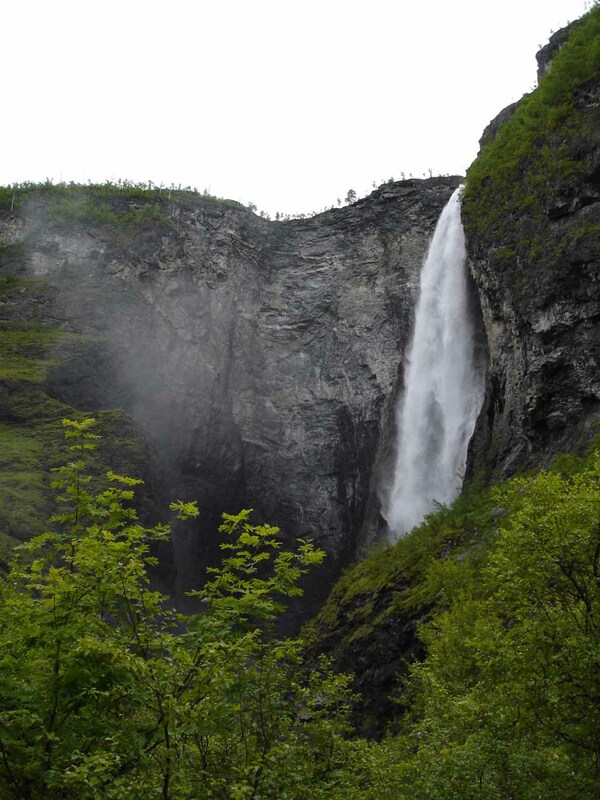 Julie and I visited Hjellefossen after leaving the town of Lærdal (sometimes written as Lærdalsøyri on the maps). 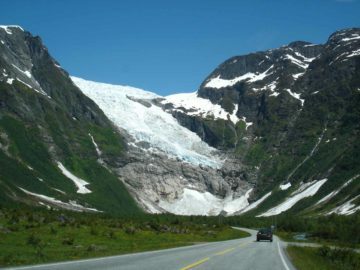 From there, we drove about 53km on the Road 53 through the Fodnes Tunnel (Fodnestunnelen) then along the eastern shores of Årdalsfjorden to the town of industrial town of Årdal. 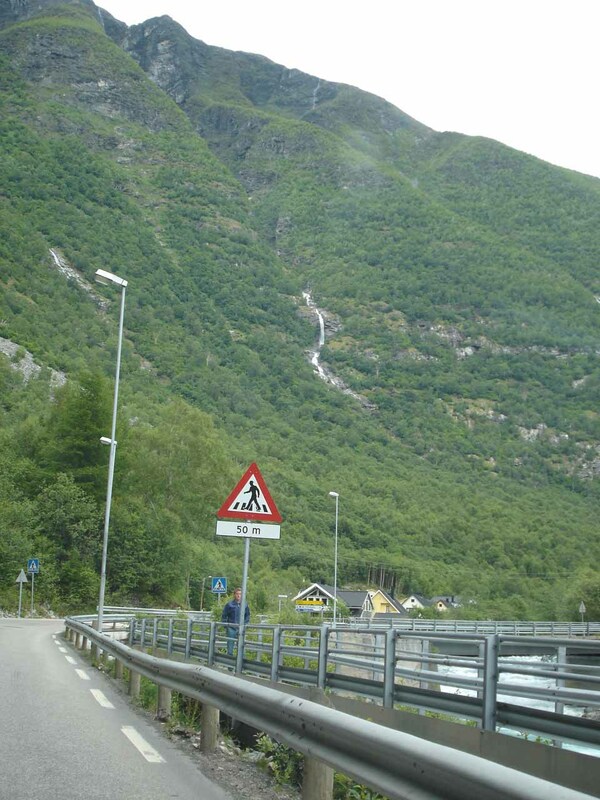 Within the town of Årdal, we turned left on Storevegen, then turned right on Utladalsvegen towards Øvre Årdal (Upper Årdal). After about 6km on this road (which entered Utladal Valley), we arrived at the car park and turf-roofed bathroom, which was on our left. 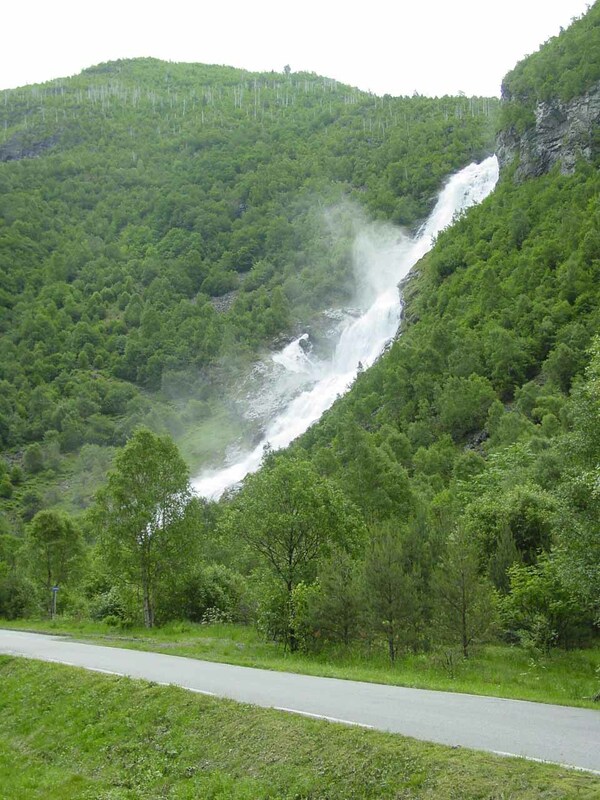 Hjellefossen was besides the road on our right. For context, Årdal was 225km (3.5 hours drive) west of Lillehammer, 303km (over 4 hours drive) northwest of Oslo, and 253km (nearly 4 hours drive) northeast of Bergen. The main waterfall further into the Utladal Valley was Vettisfossen, one of the tallest unregulated singular free-falling waterfalls in Norway. 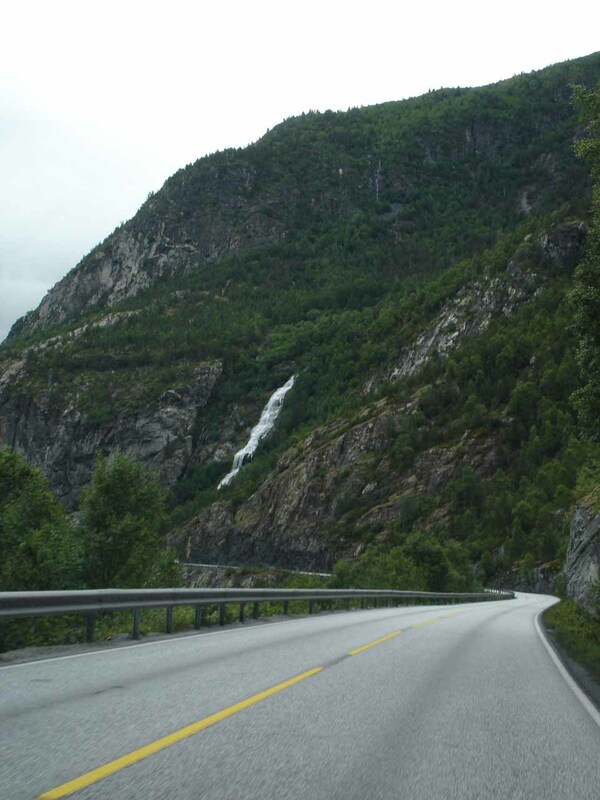 Hjellefossen was merely on the way there.